Stories ©2008 Walt Lockley and/or Alison King, editor. All rights reserved. Photos ©2007-16 Walt Lockley, Alison King, Yuri Artibise, Purple Nickel. 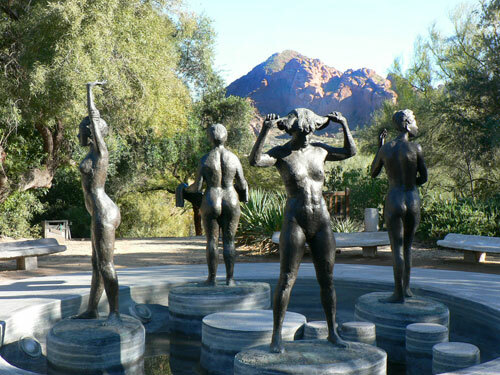 Blaine Drake's major single work would probably be the Unitarian Universalist Congregation of Phoenix, around 40th Street and Lincoln, one of a string of vintage churches on that stretch of Lincoln. 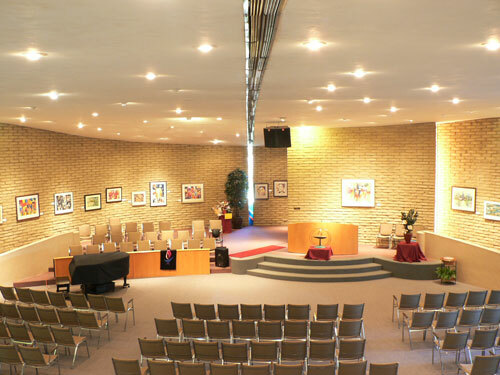 The Unitarian Congregation building stands in original condition, and a thoughtful building that sheds more light on Drake's priorities and tactics as a designer. Drake was one of the original apprentices at Taliesin and was chosen by Olgivanna as Wright's house chauffeur because he could keep his mouth closed, and she could talk to Frank frankly. They say his face and his voice resembled Wright's so much he would frighten the other apprentices occasionally. 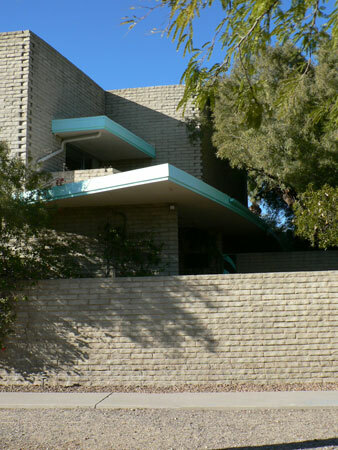 Drake set up independent practice in Phoenix in 1945, remaining on good terms with the fold, and designed well over 100 custom houses in the valley. The Dr. French house on Lincoln is among the most lavish. 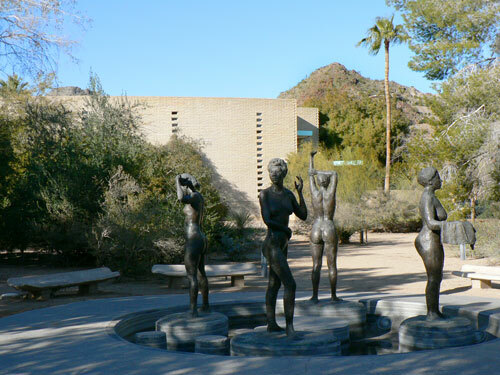 Drake also did work at the Camelback Inn, particularly the small stone chapel, and he's credited as co-designer of the original iterations of the Phoenix Art Museum in 1959 and 1965. There unfortunately the design work (the gravy) was done by Alden Dow's office up in Michigan, and the contractor and money stuff (the lumps) were left to Drake. The Universalist dates from March 1961 and is a thoughtfully-planned and well-detailed brick building that is private almost to the point of neurosis. The sanctuary has a rounded curve, almost a brick prow, pointing out towards Lincoln, but it's shielded and hidden by mature landscaping. There are two flanking parking lots, and no clear entry. You have to go looking for the entrance over on the east side. 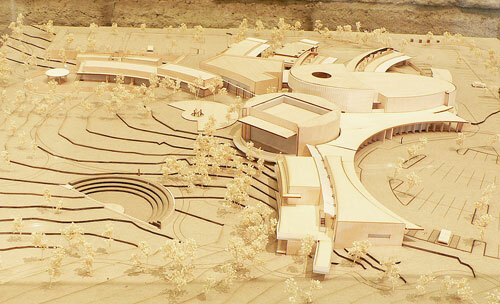 On the west side, protected from the street by a tall brick wall, there's a low simple one-story curved wing containing offices and classrooms with glass walls facing north, facing an informal courtyard formed by the brick privacy wall. It's a kid's realm in there, with lots of tricycles and shade structures. 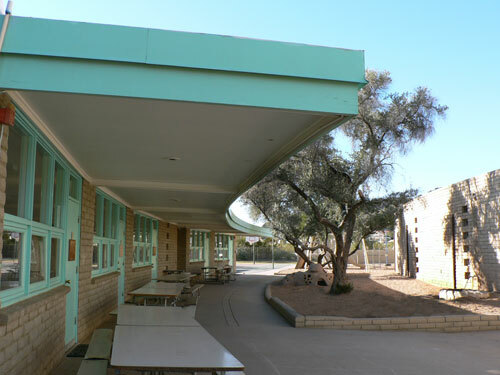 With the shapes, slender columns and all the trim painted a single mint green, it's a very functional and witty modernist design, in the same stripped-down straightforward problem-solving ethic that produced the WWII Jeep (for instance) and was once so consistent with the open and simple ethic of desert living. Inside the sanctuary is another experience entirely. There's a cool, secluded, cavelike feeling in the sanctuary, because of the darkness and the coolness and also because of the shape. It's a protective roundness. Seen from overhead, the floorplan is like a hard-boiled egg with the fattest third cut off. Let's call it a truncated ovoid to sound more official. 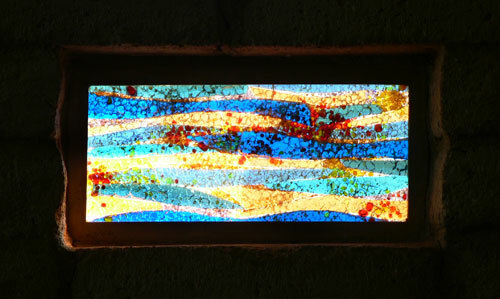 The interior shapes of the sanctuary are complicated by additional long curvatures, different on each side, and there's a thin black channel on the ceiling that terminates at the most-forward point, and there it meets the top edge of a stained-glass slit-window that runs to the base of the building. This marks the top and front of the building, inside and outside. Important for orientation. When you're inside, it marks the direction of God, or at least tells you which way to face. The Unitarian Congregation building is a daring-but-rational, mostly-successful design experiment, and it's lovingly thought-through and planned-out and detailed. Here again, it was meant to be surrounded by the desert, and it currently has beautifully empty desert property around and behind it. 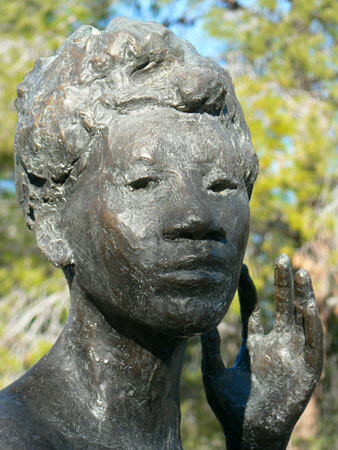 We should also mention that John Waddell's Birmingham Group is out back, the memorial to the four young black girls killed at Sunday School when the Sixteenth Street Baptist Church in Birmingham Alabama was bombed in 1963, depicting the four girls as if they had lived and grown up, and were green, and were facing away from each other. This is among Waddell's most important work. "Perhaps the churches are having trouble holding onto their young people. 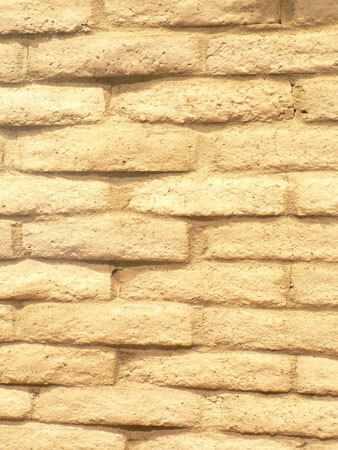 New architectural forms, they believe, may stimulate interest. After all, a chuch is a 'commercial' enterpise, too; a big part of their advertising is their building. It's a fact that any chuch which puts up a new building will increase its congregation at once." "I couldn't use typical devices to create a church atmosphere. 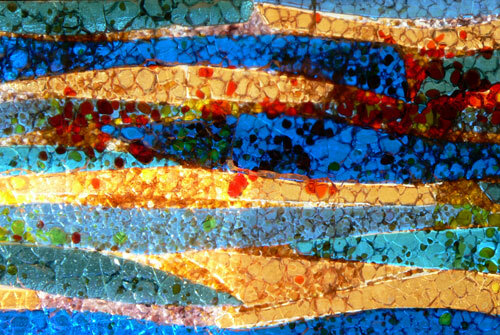 I used a curve followed by a curve to give a softer, more pleasant feeling than square corners." "We won't have stability in chuch design until society settles down." 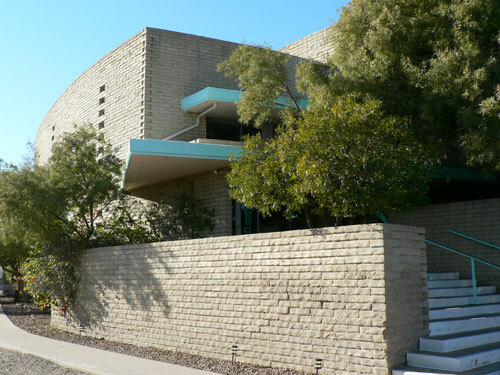 -- Blaine Drake quoted in Arizona Days and Ways Magazine, November 12 1966 This building is currently being expanded by Scottsdale architect Doug Sydnor (whose father, by the way, was in partnership with Ed Varney, designer of the Valley Ho and other local landmarks). You'll be glad to know the Waddell group and most of the open space are safe, and the expansion is being done with intelligent sensitivity to the original design. 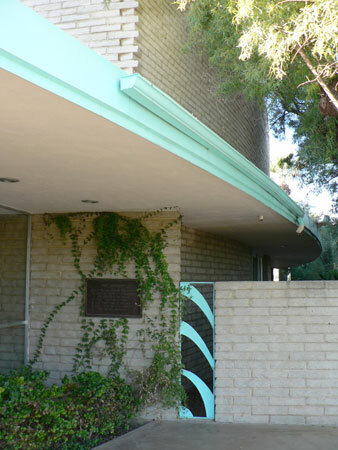 On the topic of the building's privacy, Doug chuckled, used the word "fortress-like," and pointed out that, around 1960, the Unitarians had been so active in civil-rights causes that they couldn't get a leased space anywhere in the valley. They were locked out. Therefore, they built their own space, and built it to feel private and safe. Before we sentimentalize the history of Phoenix too much, these kinds of things are good to remember.